It’s no secret that I love a good taco-inspired recipe. Mexican night happens almost on a weekly basis in my household, and I’m always looking for a fun new way to add a twist to the dishes that I prepare. Cooking with venison is an art that I’ve been learning slowly over the past few years. It’s absolutely delicious in these Venison Taco Bites, and they’re a huge hit with the hubs! Growing up, we never ate venison in my house. My father was not a hunter, and my mother would probably not have allowed any sort of meat other than beef, chicken, fish or pork on the table anyway. (She’s not a meat person at all.) So for these reasons, I never had the chance to eat deer meat, and I certainly had no idea how to prepare it. That is, until I met my handsome husband at the tender age of 15. I fell head over heels for a country boy who loved to spend his weekends hunting and fishing. I was surprised to learn that his family never bought beef, but instead has always cooked with deer meat that they hunted themselves. I thought that was so stinkin’ cool! It was totally different from the way that I grew up, and I loved it. And now, we’re happily married with a freezer that is stocked with venison that my husband hunted and processed himself. It’s always enough to sustain us for the entire year, so I never have to purchase beef at the grocery store. Mega win! 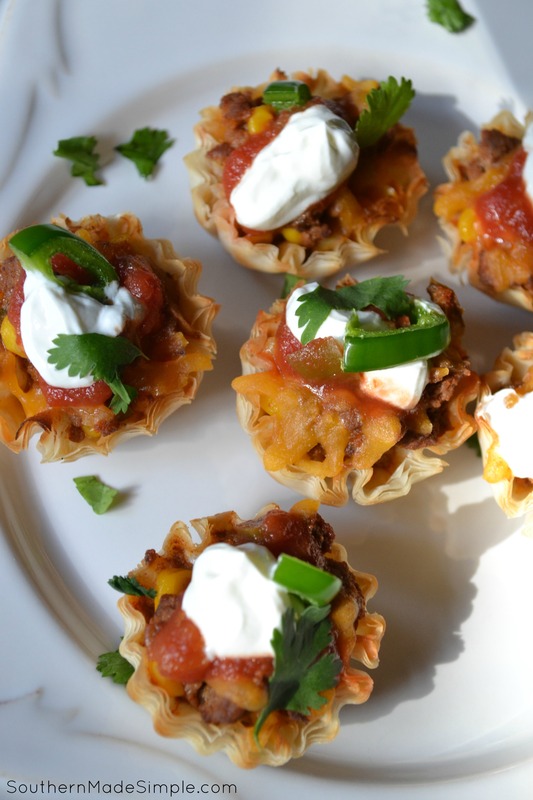 I filled small filo cups with the taco filling and topped them with delicious cheddar cheese. I then baked them in the oven for 10-12 minutes and topped them with my favorite taco toppings! 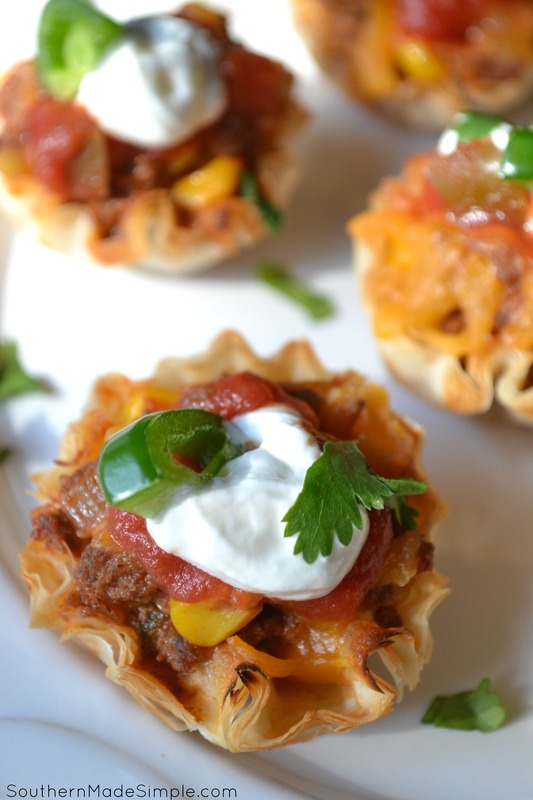 The inspiration to create these mini taco cups stemmed from the opportunity to try out new Daisy® Squeeze Sour Cream. 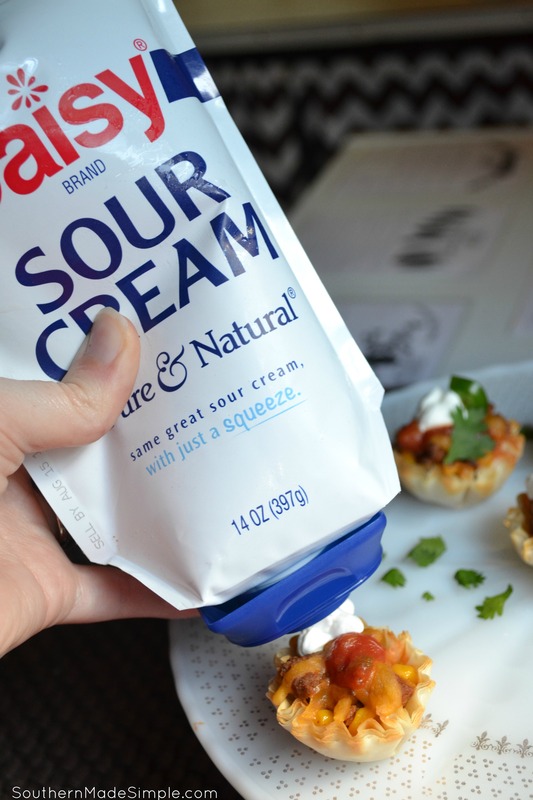 I was really interested in the concept of it being in a squeezable container, because I often find that a regular tub of sour cream tends to separate and collect water at the top when it’s been sitting in the fridge for a few days. I was pleasantly surprised to find that that hasn’t been the case at all with the squeeze pouch! I also knew that being able to squeeze a tiny dollop on these mini taco bites would be MUCH easier than using a spoon. Besides, who want’s to dirty up a spoon when you don’t have to? Top with sour cream, additional salsa, cilantro, or any of your favorite taco toppings! I served these venison taco bites as a complete meal for my family, but they would be absolutely perfect to serve as an appetizer for a party or event. 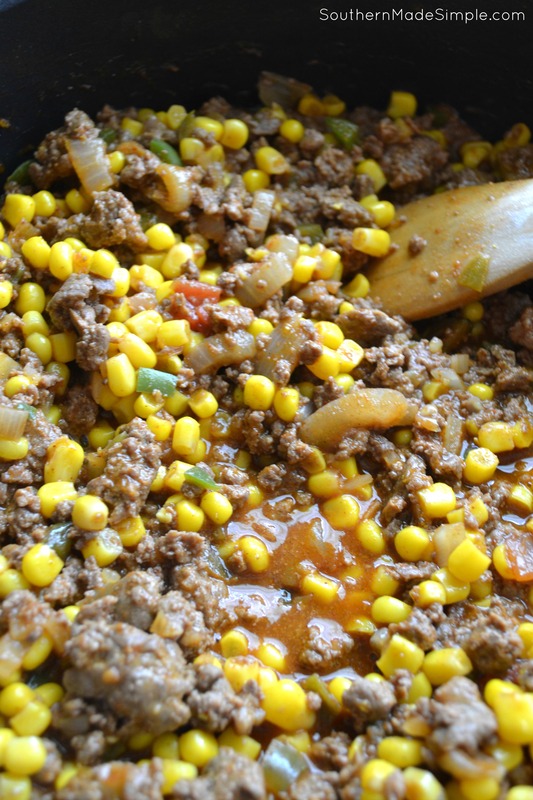 And you can totally substitute the ground venison for beef or turkey – no problem at all! When you hit the grocery store to pick up all of the ingredients to make this, don’t forget to stop by the dairy section and look for the new Daisy sour cream in the squeezable pouch! Do you ever cook with venison? Are you a huge fan of Mexican food like I am? If so, you MUST try this recipe! Do you have other recipes that you love? Leave a comment below and share! 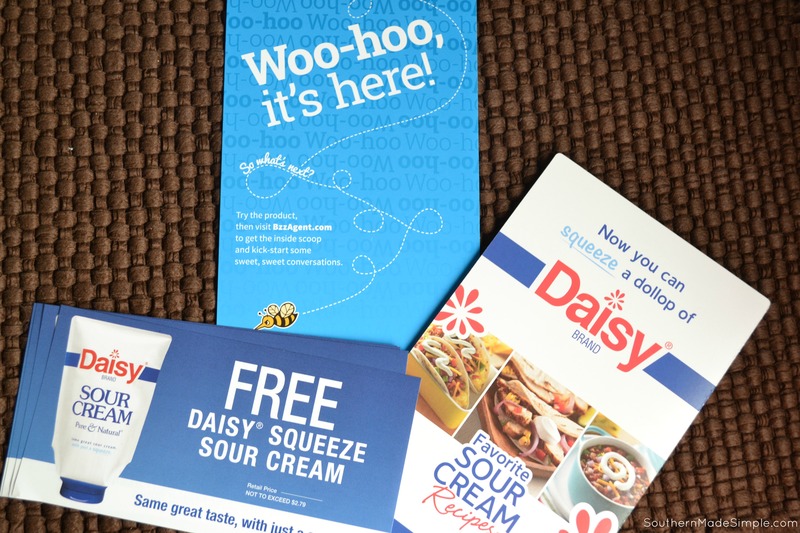 TWO lucky Southern Made Simple readers will win a full value coupon to purchase Daisy Squeeze Sour Cream for themselves! Just enter using the giveaway form below. Giveaway ends 7/5/16. US only. Open to residents of the United States 18 and older. Limit one entrant per household. Giveaway will end at 11:59pm CST on 7/5/2016. Winner will be drawn using Giveaway Tools. Entries will be verified. Winner will be contacted via email and will have 48 hours to respond before the prize is forfeited and a new winner is selected. Southern Made Simple is not responsible for prize fulfillment. It would be great on black bean burgers. I like to put it on my nacho salad. I like to put it on tacos. I love to top my baked potato with a dollop of Daisy! The most common thing we use it for is a mix-in for mashed potatoes. A dollop of Daisy would go on a loaded baked potato for me! I like a dollop on my baked potato. A dollop of Daisy goes great on a taco. I like to put dollop in a bowl then sprinkle some garlic salt and dip my chips in it. I like a dollop of Daisy sour cream on my loaded baked potato! 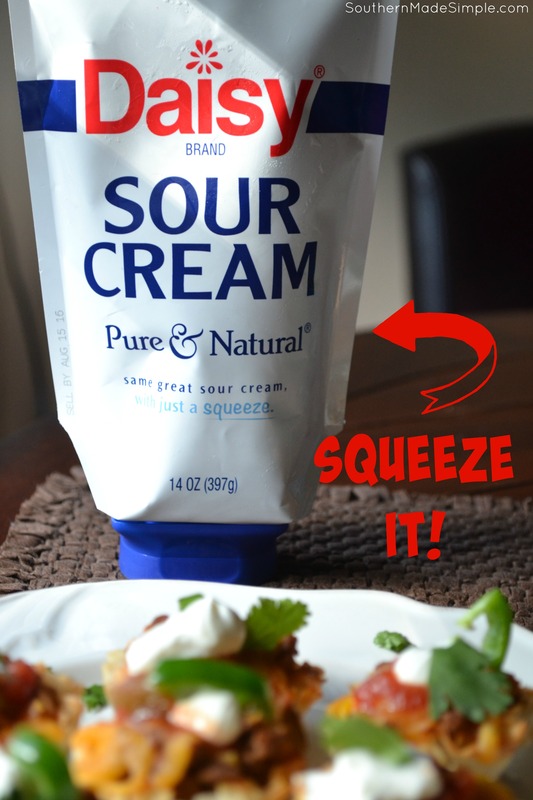 Can’t have a Taco Tuesday without Daisy sour cream! I love to put a dollop of Daisy on my baked potatoes and nachos! I love Daisy on my burritos or any Mexican food, it’s also really good on a baked potato. My favorite is baked potatoes, along with butter and chives! I’d put it on tacos, burritos, enchiladas, and baked potatoes. Thanks. I love love love putting a dollop of Daisy on my tacos. Oh…for me its more like what I dont! Haha..I love sour cream on my mexican lasagna! Oh yummy! I love my dollop of Daisy on a baked potato! I put it on so many things. Any Mexican food, on baked potatoes, on top of tomato soup, on crackers with smoked oysters and on and on. I like it on taco salad. I know it sounds odd, but we like sour cream on rhubarb pie and cobbler. My son loves Daisy sour cream. This would be a treat for him. I like to put it on a baked potato. I would use it on tacos, yum! On tacos or straw hats! I would put it on a baked potato. I love to put a dollop of Daisy on my Mexican foods. I like to put a dollop on my chicken wings! It’s a great, low calorie dressing substitute. I’ll put it on just about everything. Potatoes especially, but also tacos, and as the main ingredient in beef stroganoff.